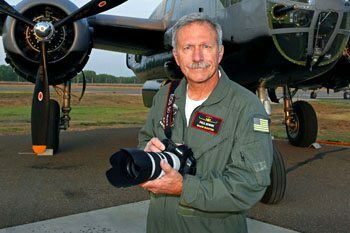 Paul Bowen, a commercial photographer based in Wichita, Kansas, has been shooting aviation photography since 1972. He is credited with over 1,000 magazine covers and countless advertising campaigns. Paul is one of 60 professional photographers who make up Canon’s “Explorers of Light” program. His four coffee-table books have gained critical acclaim, along with his annual calendar, Air To Air Warbirds. Business and Commercial Aviation Magazine honored Paul as one of only three recipients of its Vision Award for 2008, based on his contribution to aviation. In 2009 he was nominated with five other companies and individuals as a candidate for Aviation Week & Space Technology Magazine’s annual Laureate Award for the Business/General Aviation category. Paul had previously been named “Photographer of the Year” by Pro-Pilot Magazine. In 2008 ISAP awarded Paul The Award of Excellence, their highest honor, for “a lifetime of outstanding contributions to aviation photography”. NOTE: These are remarks made by Chad Slattery at the 2010 Symposium, introducing Paul Bowen as the 2010 Recipient of ISAP’s George Hall Lifetime Achievement Award. Whether making, editing, or publishing aviation photography, a single soul can have a profound impact on our profession. In 2002 the International Society for AviationPhotography established the Lifetime Achievement Award to recognize outstanding individuals whose inventiveness and dedication to the field throughout their careers have improved our profession and positively influenced others. They are, quite simply, our role models. In 2006, the Board of Directors voted to name the award in honor of George Hall. George exemplified the very best our profession has to offer. He was talented, bighearted, and a mentor to all of us who aspired to be an aviation photographer. This year’s recipient is in every way his equal. Paul Bowen has perfected the art of air to air photography, refining old techniques and developing inventive new ones. He is generous with his time, his knowledge, and his resources. For nearly four decades now, he has been the best of the best. He is credited with over 1,000 magazine covers and countless advertising campaigns. Paul was selected as one of 60 professional photographers who make up Canon’s “Explorers of Light” program; in 2009 he was named a laureate by Aviation Week. Somehow, he’s found time to publish four richly printed volumes of his photography. But if you ask him to name the best thing that’s ever happened to him, he’ll tell you it’s his wife Gail and his four children.